Dozens of women involved in the Arizona craft beer industry came together earlier this month at Lumberyard Brewing Co. in Flagstaff to celebrate the movement of women in industry and to brew a beer for charity. Cleverly named Murder She Oat, the creamy brew is dubbed a “throwback oatmeal IPA,” and has a velvety mouth feel combined with a heady blend of Simcoe, Mosaic, Centennial and Melon Hops. Based off the popular television series “Murder, She Wrote,” the beer is a celebration of persistent and intelligent women, much like those who created it. The highly anticipated release of the brew will take place at 3 p.m. at Bitters Bar & Food in Scottsdale on February 8 and will be carried at various taprooms across the state in celebration of Arizona Beer Week. Proceeds from the beer’s sales will be donated toward several nonprofits benefitting women’s safety programs throughout the state, including the Northland Family Help Center in Flagstaff, the Prescott Area Women’s Shelter (PAWS), the Sojourner Center in Phoenix and Wings for Women in Tucson. 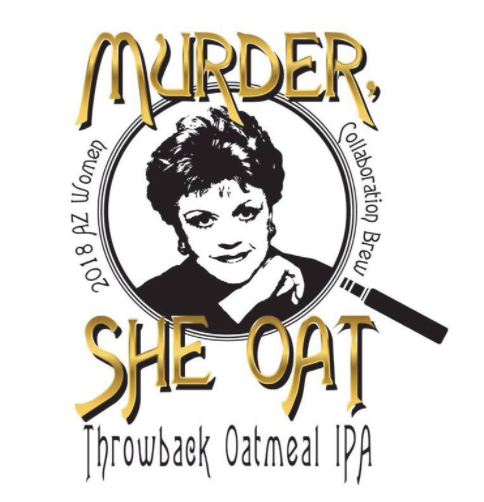 Some of the additional breweries involved in the creation of Murder She Oat include, but are not limited to: Beaver Street Brewery in Flagstaff, Pedal Haus Brewery in Scottsdale, The Perch Brewery in Chandler and Barrio Brewing Co. in Tucson. In addition to Lumberyard Brewing Co. and Bitters Bar & Food, the special brew will be available at dozens of Arizona breweries, including O.H.S.O. and The Shop Beer Co. until the last pint is sold. Beer fanatics can also sample Murder She Oat at the Arizona Strong Beer Festival on February 10 at Steele Indian School Park in Phoenix.